Let's celebrate the holidays around the world! After a joyous title song, your students will then enjoy presenting traditional songs and carols from 15 different countries. The optional script (10 narrators per song) describes the seasonal customs and traditions that occur in each country during the holiday season. Why not travel the globe this Christmas? This is an excellent choice for schools-and church youth groups, too. 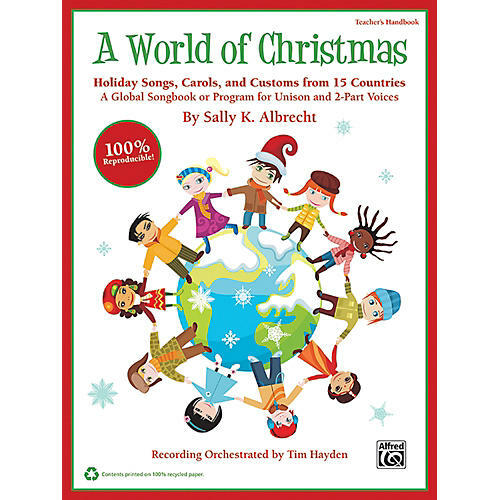 Titles: A World of Christmas * Caroling on Christmas Night (England) * Two French Carols (France) * O Christmas, We Greet You (Scandinavia) * Rocking Carol (Czech Republic) * Ring the Bells, Little Children (Germany) * Come Now, Rejoicing (Poland) * Fum, Fum, Fum (Spain) * A Still, Silent Night (Austria) * Carol of the Bagpipers (Italy) * An African Celebration (Africa) * Dedushka Moroz (Russia) * Din, Din, Din (Venezuela) * The Search for a Room (Mexico) * Huron Carol (Canada) * Shepherds, Go Tell! (USA).